How to properly add accessories to a bedroom dresser is a question we are always asked. It is so easy to add too much. They key is to add just one, or just a few accessories, keeping them in proportion to the size of your furniture. 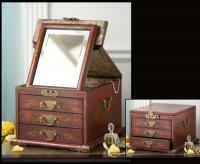 On a smaller dresser, one interesting piece such as a decorative jewelry box or unique sculpture may be all that is necessary. On a larger piece of furniture, for example a triple dresser, several elements could be used. A vase could adorn one side while placing an elegant photo frame on the other side. Decorative perfume bottles can be placed in the middle. Another great option to accessorize a dresser is to use a few books with decorative bookends on either end of the collection. 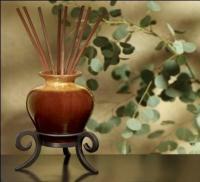 Reed diffusers are another decorative option that will also provide a nice scent to the room. A small tray on the dresser top is perfect idea for placing perfume or cologne bottles. 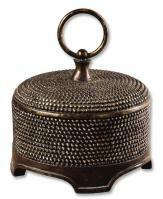 It will keep any excess perfume from staining your furniture. Small decorative boxes placed on top of the dresser are useful for storing things you use every day, such as rings, watches, cuff links or hair accessories. Overall, remember less is more. You don’t want to clutter your dresser top. For more decorating ideas visit http://www.cheapchicdecor.com/.